I can't really explain why it has taken me so long to read Arthur Conan Doyle, but I must admit to have been much inspired by my recent obsession with the BBC series, 'Sherlock'. 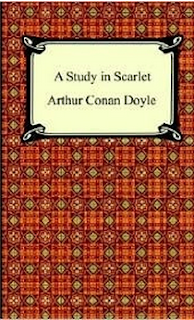 And where better to start than with the very first Holmes mystery; 'A Study in Scarlet'. This little book is narrated by Dr John Watson, who, recently having returned from the Afghanistan war, with 'neither kith nor kin in England', happens to come into contact with Sherlock Holmes who, likewise, is alone and seeking a house-mate to share the expense of living in London in the 1880s. I was expecting violin-playing, carriage-rides and plenty of fog, but I must say that the deserts of Utah came right out of the blue. I had no idea that a Holmes novel ever ventured across the Atlantic, but it does so twice in this novel alone. One minute I was lounging around the rooms of 221B Baker street, sipping tea with Mrs Hudson, and the next I was in the American midwest, dying with thirst and planning to meet my maker, or Clint Eastwood at least. Conan Doyle could have had a very successful career writing Victorian Westerns, but instead he conjured up the daring duo of Holmes and Watson, whose clever deductions and uncanny observations out-wit the wicked and out-manoeuvre the malevolent. And aren't we glad that he did, with some 56 books in the series in total for us to enjoy, not to mention the countless spin-offs and sequels, featuring the consulting detective in the deerstalker hat with a passion for puzzles. I cannot finish without referring somewhat to the exceptionally good BBC series 'Sherlock'. (Stop reading now if you have not yet seen the episode in question.) 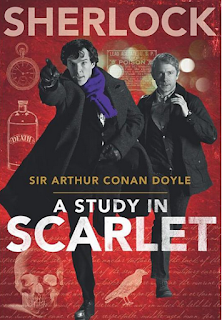 Series creators Moffat and Gatiss, have adapted this text, calling it instead, 'A Study in Pink', which relates more to the case in question and just sounds more modern than 'scarlet'. Indeed, everything about the new Sherlock is modern: the architecture, the décor and even the gadgets. Gone is Holmes's large spying glass, and in its stead is a tiny pocket one, (available from Amazon for £19) and everything from mobile phones, flat screen portable TVs and computer lap-tops all feature prominently in the cases. In terms of the basic plot line, there are clear similarities between the original and the new adaptation. The victims are dispatched in a similar manner, the murderers have the same occupation and affliction, and the stories both begin with the introduction of Holmes to Watson through a mutual acquaintance, Stamford. However, the original text differs in that it explains in full detail the motivation behind the killings. Indeed, in Conan Doyle's text, the word 'rache' scrawled in blood on the wall, does in fact, mean revenge in German, unlike the new adaptation, which opts to lengthen the word to 'rache..l'. But, regardless of the modern glitz and soft-focus dazzle of this production, the heart of the story remains the same: a couple of lonely obsessives find friendship and mutual relevance while solving puzzles and combating crime. Indeed, the archaic monikers of 'Holmes' and 'Watson' have been replaced by the altogether more socially acceptable 'Sherlock' and 'John', finally allowing the fans to be on first name terms with the Baker Street boys, played so brilliantly in this BBC series by Benedict Cumberbatch and Martin Freeman. I highly recommend both the novel and the series. Both lead naturally to the other, for according to Moffat, everything goes back to the Conan Doyle novels and already I see various references and nods to the original texts when I watch the dramatisations; the case of the speckled blond, a pun on the text, 'the speckled band', to name but one,which makes the viewing all the more pleasurable. So, if, like me, you are still puzzling over the mystery left us at the end of series two, the answer should, if Messers Moffat and Gatiss are to be believed, be found in the original novels. For consider how both Moriarty and Holmes jumped from the waterfall in the original 'Reichenbach Falls', but only Holmes survived... surely that tells us something about the identity of the broken body found on the ground outside Bart's Hospital? And the various hospital workers who descend on the bleeding Sherlock, don't they all look a little bohemian to you, long haired with flared suits? Perhaps members of Holmes's homeless network, who have thankfully replaced the non-p.c. 'Arab boys' street children of the novels, have once again come to his aid? Of course it is Molly who is the ultimate friend here, with Sherlock so uncharacteristically asking her for help, and luckily she is at hand in the morgue, to supply Holmes with dead body-doubles and to fake official reports. One cannot ignore the importance of John's position in the scene, given that Sherlock insists not once but twice that he stay where he is and not move. 'Do it for me', he begs. That is one thing that Sherlock never does and perhaps this is the very thing that Moffat was referring to when he said that the solution to the mystery lies in Holmes's doing something that he never usually does. 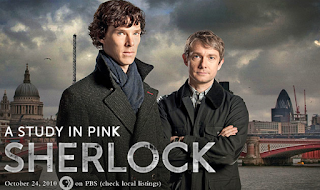 As Sherlock tells us in 'A Study in Pink', 'I've never begged ... in my life!'. But let us not forget the role played in this scenario by Mycroft Holmes, Sherlock Holmes's smarter brother, who has been so badly used my Moriarty as a source and must suffer considerable guilt at the role he has played in his brother's demise. One cannot imagine that he would stand idly by and let Sherlock take the fall all by himself. (No pun intended!). I would not be surprised if he were somehow behind his brother's disappearance, being so total and complete as it is, thus allowing the dust to settle but only until his brother makes a valiant return, clearing his name when the time is right. With the help of a well placed laundry truck, a beautifully timed road accident and the angular geography of London, the mighty Sherlock seems to defy death and logic all at the same time. Well, that's my theory anyhow. So...only 55 more stories to go... I might just have them finished by the time the next Sherlock series is due for release in about 2014..a somewhat elementary deduction. Scarlet ver. Has a motive about revenge of great love and criticism for fnatics who ran out from another fnatics being harsh to others just like the original ones. 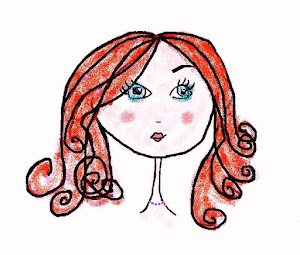 It makes Scarlet one of the greatest novel in history, not just a great mystey novel. Pink ver. Has some kind of deep motive that cross people's heart too. But insurance money and joy for kill plus criticism for people being arragant in front of cabbies is not that much heart-breaking as Scarlet ver. Does. Basically, moffat and his team did a great job as a tv show but as a novel, sir arthur wins like always.